If you’re a vegetarian or a vegan you’re probably pretty familiar with the humble chick pea and tofu – one of my favourite things about them is how versatile they are when it comes to cooking. 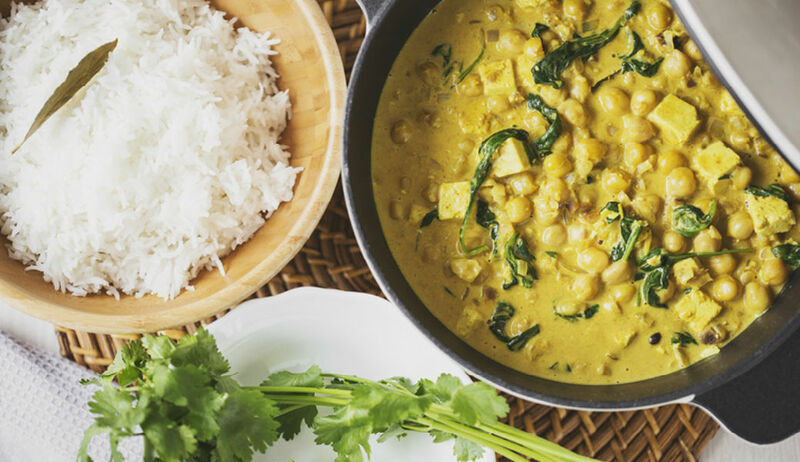 While I was sifting through Pinterest trying to find some new ideas for vegetarian dinners I came upon a recipe for a vegetarian and vegan friendly chickpea, tofu and spinach curry by a couple of food bloggers called Cocoon Cooks. Here’s their recipe for a delicious warming dinner idea, you can also check out their blog here. Start by gathering, measuring, chopping, crushing, grating, draining, and cubing all of the ingredients. This will improve your dynamic in the kitchen. Add the rest of the ingredients (except for the spinach), let it come to a boil and reduce heat to a low simmer. These are all ingredients that need only 5 to 8 minutes to heat up and absorb the flavours. By then, the coconut milk will also have reduced and become a creamy and velvety sauce. Add the spinach leaves one cup at a time and mix them in right before turning off the heat. They will wilt down in a matter of seconds, and your curry will be ready to serve!